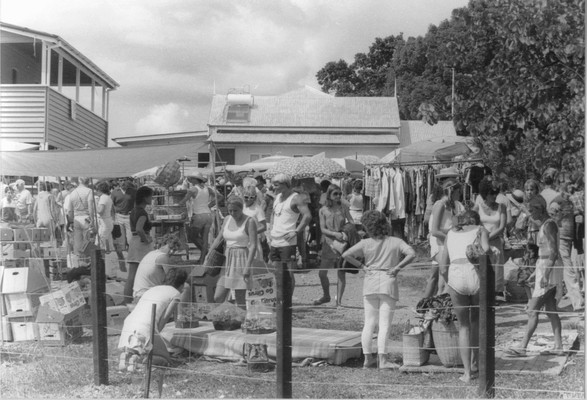 Eumundi Markets in the 1980s. 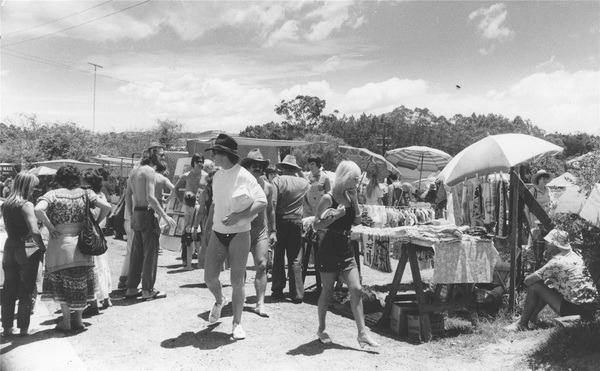 Every picture tells a story so a series of photos showing the Original Eumundi Markets 40 years ago when it began and today will speak volumes on the enterprise that next month celebrates its anniversary. 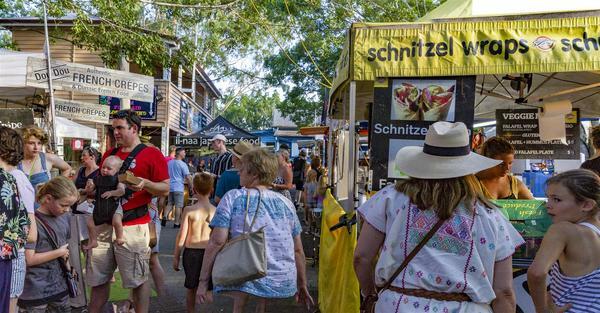 Discover Eumundi Heritage and Visitor Centre is busy developing an exhibition in its arts space to commemorate and celebrate the 40th year of the Eumundi Markets which is still run by non-profit community association the Eumundi and District Historical Association. The Heritage Centre has an extensive collection of objects, photographs and documents relating to the history of the Eumundi Markets and will use these resources to create a glimpse into the past of what has become a world famous market. Many of the photos and information in this heritage collection go right back to the beginning of the market which is recorded as starting on Saturday 24 March 1979 in and around the Eumundi CWA hall with only three stalls and eight visitors (not counting stallholders family members). It has now grown to have an annual visitation estimated at 1.2million. You will be able to view images of the early markets and many of the marketeers, listen to some recorded recollections of the early market days and leave your own memories on the market memory board. Newspaper clippings going right back to beginning will show the development of the market and how the market almost ended before it really began in the early 1980’s. The First 40 Years exhibition will open on Saturday 23 March at 2pm in Wan’din’in arts space at the rear of Discover Eumundi, 73 Memorial Drive. RSVP is a must to info@discovereumundi.com.